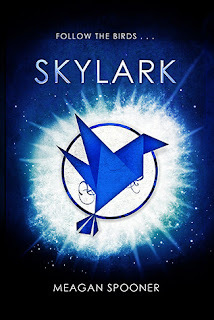 I had heard very little about Skylark by Meagan Spooner before it landed on my doorstep, but I loved the cover and that my review copy came with instructions on how to make the origami bird that's on the front cover! And while I found myself slightly confused as the story starts and we're thrown head-first into this new and slightly disturbing world, I was also really intrigued and had to keep reading to find out more. This story is about Lark, this teenage girl who is living in a world surrounded by walls and powered by it's citizens. It's meant to be a great honour to be harvested and once it happens, you're deemed an adult and given a job and responsibility. Lark has been passed over much longer than most young people are but once she's called in for her harvest, everything changes. Because Lark then realises what harvesting entails and also that there's something a bit different about her. I think the harvesting of children's magic is the part in the book that I stumbled over a bit. I couldn't really picture it in my head so I was left feeling a bit confused. What didn't confuse me was Lark's fear and revulsion towards her future prospects and what she does find lurking behind the people in charge of her town. And so Lark leaves everything she's ever known behind in order to 'follow the birds' whatever that means. Skylark was a really different book to anything I've read recently and I really loved that about it. I love the combination of fantasy and dystopia that plays a part in the book. I felt like there was plenty to keep me excited and surprised with the different twists in the story. I liked Lark's character and those that she meets outside of the wall, especially Nix the robot creature powered by magic and Oren, the wild boy who rescues Lark and manages to keep her alive out in this dark land filled with monsters. Skylark was a lot of fun. I loved the fast paced, the characters and definitely the shocking plot twists. I'm excited for more in this series! This sounds like a really unique book and I'm left wondering why I haven't seen more of it. I haven't heard of it before this review which is a little sad. It sounds like a good read and I might try it sometime in the future- I love shocking plot twists too!